Norfolk's new Police & Crime Commissioner, a Mr. Stephen Bett, reckons that driving to the road conditions and using common sense would be better for everyone than following speed limits. The counter-argument? 1 in 4 road deaths (apparently roads can die) in the UK are related to "excess speed". He has defended himself by saying "my comments were designed to provoke the debate", so let's have it! The Telegraph reported that, hey, guess what! These comments are controversial, while being sure to include the contrasting opinions of similarly-positioned people who call it nonsense. > The problem is that there are so many signs drivers get mesmerised by them. If we are going to do anything about speed and villagers we ought to take down all the signs and say all villages are 30mph and you drive on roads like they do in Germany and Italy, as road conditions say. > [How fast people should drive] depends on the driver - if you've got a Formula One racing driver well you can go flat out. If he was a racing driver and really, really good and had tremendous reflexes, probably as fast as the car will go. > While speed may be a factor in many accidents I believe it is inappropriate speed that is the main contributory factor. That is why I call on drivers to consider the road conditions and drive accordingly. > We need a common sense approach to simplify regulations and limits for drivers and reduces the need for all these changes of speed limits. I agree with those who believe we should revisit the current upper speed limit of 70mph on our motorways and modern roads which have been built, along with vehicles, with safety in mind. > This may be unpopular is some quarters and research would point to whether this could be universally acceptable - my comments were designed to provoke the debate. So OK, let's take a look at these comments. As someone who considers himself a competent driver, I can't say I've ever been "mesmerised" by speed limits. Still, the fact that a use-your-brain system is working in Germany and Italy is a confidence-booster, especially as Italians probably all drive like maniacs (no offence Roberto G). 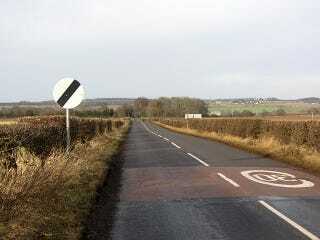 In the UK we already use this for rural B-Roads; the sign atop this post means "National Speed Limit", i.e. 60mph as it's a single carriageway. These signs are sometimes seen on roads where even Colin McRae would've struggled to maintain or even hit 60mph, because rather than simply meaning "do 60", you're supposed to drive to the road conditions. So if the road is only a car and a half wide and full of blind corners (which happens in the countryside), then you take it easy in case someone's coming the other way. It doesn't have to be that extreme of course, but you know what I mean. The question is, would the same system really be effective with little old ladies and little old buildings surrounding you instead of bushes and fields? The second point is a trickier one. What we have to remember is that as well as braking distance, thinking distance is greatly increased with more speed. At the end of the day, your brain doesn't operate in inches, it operates in tenths of a second, and if you're covering twice as much ground in that 0.2 seconds it supposedly takes you to react to something, then that'll have an effect on your ability to avoid an accident as well. The idea that having an FIA Super-License would let you go full-Loeb at all times is perhaps optimistic, then, and besides, when you go racing you get the need for speed out of your system where you should: on the track. Thus, F1 drivers would, I assume, only get lead feet during off-season or maybe the summer break. At any rate, not all drivers know their mental limits, so with this rule in place there could be some who overreach themselves and stuff it into a tree. Or your Nan. After all, isn't that already commonplace, in particular with young drivers? It would be lovely if all drivers were intelligent and astute enough to drive in a manner that accurately reflects road conditions, but at the end of the day, not everybody can do that, or bothers to do that, which is the problem. IIRC British drivers do more speeding than any other road-related law-breaking. Can we really trust everyone to drive smart? Lastly, raising the motorway speed limit from 70 to 80mph would be pointless, because everybody already does 80mph and the police won't stop you for doing it. That's not an exaggeration. Sure everyone slows down to 70-ish when passing a police car, but you'd have to be approaching 90mph before you got in trouble... unless you go through a speed camera. David Williams, a spokesman for the Guild of Experienced Motorists (yes, that's really a thing) called it "just nonsense. One in four road deaths is caused by inappropriate speed. It is a very important issue and it needs to be enforced because we need to protect innocent road users from people who think they can drive like racing drivers on the highway." David Quarmby, chairman of the RAC Foundation backed this stance up, commenting: "Speed limits are set to reflect the inherent risks of different types of road - risks to drivers and other road users such as pedestrians and cyclists. While Stephen Bett may be mesmerised by varying speed limits, there is no evidence to suggest the average driver is. "The observance of speed limits has improved significantly over the last decade, and as a result the number of people killed and seriously injured on our roads has fallen nearly 40 per cent in the last decade alone. Long may it continue." So yes, speed limits are there for a reason. I can't say I've ever found them baffling myself, but I'm not everyone. Honestly, it would be great if we could just use our commonsense and drive intelligently, but the sad truth is that a minority don't have any, and that's not something we can control without committing atrocities. But is there a point missed? An avenue as yet unexplored? A happy medium? Or will black numbers in red rings control our roads forever? Are they really the best thing after all?